Mecca - One of the best sites with over 96 clubs across the UK. Mecca Bingo is one of the biggest brands having more than 95 clubs across the UK. The site is operated by ‘The Rank Group’. Mecca Bingo is licensed and regulated by the UK and Alderney Gambling Control Commission. Mecca Bingo has been offering 300% Welcome Bonus, That means when you deposit and spend £10 you will get £30 bingo bonus and £10 to play in club. Are you looking to get another £10 for free? Mecca Bingo is giving you a chance to claim another tenner by playing sizzling slots. All you need to do is deposit £5 and play selected slot games, once you have played £5 on the games you will get another £10 in your account. Selected games are : – Adventures Wonderland, Atlantas Treasure, Black Widow, Cashino, Cleopatra, Clueodo classic, Crown Jewels, DaVinci Diamonds, Deep Sea Treasure, Golden Goddess, Kitty Glitter, Leprechauns Luck, Lil Lady, Luck o’ The Irish, Monopoly, Pixies of the forest, Rainbow Riches, Siberian Storm, Western Belles, The X Factor Jackpot. When you refer a friend to Mecca Bingo, you will get £20 free when they deposit and spend £10. If you are an existing Mecca Bingo Club Member, then you can get extra £5, when you join using Club membership number at registration. When you join Mecca Bingo, you will get access to Newbie bingo room for seven days whether you play on Mobile or Desktop. Britain’s got talent, Monopoly, The Hoff, Deal or No Deal, Cluedo, Take Me Out, Million Pound Drop (Also famous on Jackpotjoy Bingo), The X Factor (exclusive game), The Wizard of Oz. Withdrawals get processed within 3 – 5 working days. Customer Support: – 0800 083 1990. Open 8 am – midnight GMT, seven days a week. Address: – Customer Services, Mecca Bingo, P.O. Box 70695, London, SW1P 9ZR. 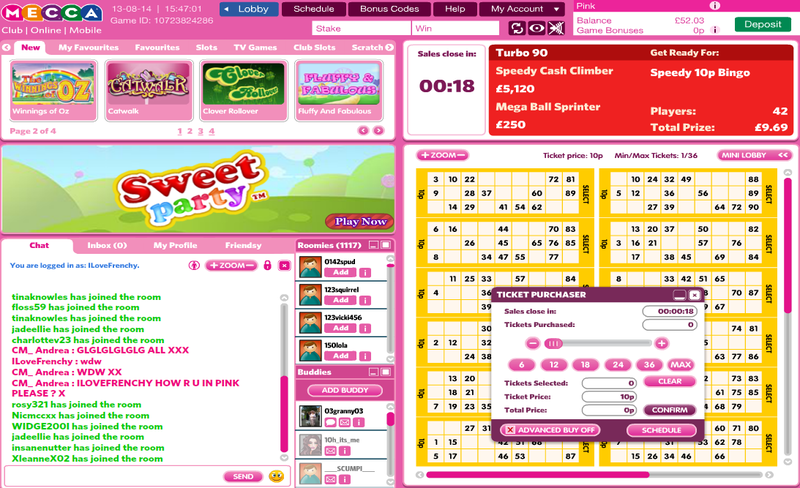 Spend £10 get £30 in bingo bonus + £10 for Club. Site with over 65 Clubs across the UK. £10 Free to play in Mecca Club. Extra Freebie when you register via your Club Membership number. How to unlock free bonuses on bingo sites? Why Discussion about Wagering and Withdrawal is Prohibited in Bingo Rooms? Bingo – Is it an addiction or fun?